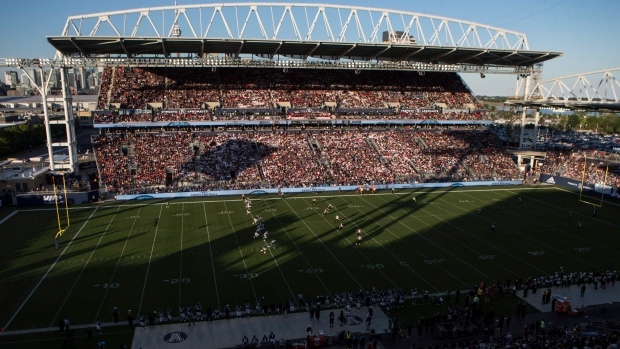 TORONTO — The Toronto Argonauts are giving Canadian football fans a break. The CFL club has reduced prices for this year's Grey Cup game at BMO Field with tickets starting at $89 and thousands more being available for less than $150. Under previous pricing, the cheapest tickets were $169 and $199 and went up to $899. Argos president Michael Copeland said Tuesday the adjustments will affect mostly the mid-range tickets for the Nov. 27 contest at BMO Field. "Ultimately, we want the stadium to be full," Copeland said. "We want people to understand how great it is to see a football game at BMO Field, especially one of the scale and excitement of the Grey Cup. "It's a business and when you run these events you do so to try and generate revenue. But if those best-laid and well-intentioned plans aren't serving the people you're trying to serve appropriately then it's up to you to do the right thing. That's what we feel we've done." Copeland said the changes reflect a recognition by the Argos that Toronto's sports landscape has been jam-packed the last year. The NBA all-star game, deep playoff runs by the Raptors and Blue Jays and the World Cup of Hockey have all happened here this year. The NHL Centennial Classic between the Maple Leafs and Detroit Red Wings will take place Jan. 1 at BMO Field, while the 2017 world junior hockey championship will be held jointly in Toronto and Montreal. And the Raptors tip off their regular season Sept. 26. "When we originally set these ticket prices, we based it on our experience in operating Grey Cups, our understanding of the Toronto market and what similar events in the market were priced at," Copeland said. "But we realize Toronto is in a very unique time right now, you can argue this is the busiest time for major sporting events, perhaps ever, in the city. "What we learned over the course of the year was our ticket pricing was very good in certain parts of the stadium, notably the higher and lower ends. It's really the middle where we felt we needed to make an adjustment . . . so people who want to come to the game can afford to come." Copeland doesn't believe the Argos made mistakes with their original pricing scheme. "At the time, the ticket prices were only marginally higher (six per cent) than last year in Winnipeg," Copeland said. "The Toronto market is generally a higher-priced ticket for sporting events and we looked at the 2012 Grey Cup game (won by Toronto at the Rogers Centre) that had over 53,000 people there and we're in a lower-capacity stadium. "So the prices as we set them, in looking at other events in the city, we felt were competitive and reasonable. What we learned was the market dynamics had changed." BMO Field's Grey Cup seating capacity will be expanded from 28,000 to roughly 35,000. Copeland said the contest is roughly half sold with most of the higher- and lower-priced tickets having already been purchased. Copeland said the Argos will be contacting people who've already purchased Grey Cup tickets shortly to discuss the changes. The 2016 season was to be an important one for the Argos. Not only did they have a new home stadium but were in their first year under the new ownership of Bell and Larry Tanenbaum, the chairman of Maple Leaf Sports & Entertainment. But Toronto has struggled this year, compiling a 5-11 record and finishing 2-7 at BMO Field. And the Argos face having to beat Calgary (14-1-1) and Edmonton (8-7) on the road to have any chance of making the CFL playoffs. Copeland admitted the Argos' struggles haven't helped Grey Cup ticket sales. "Everybody wants to see your hometown team in the game," he said. "Now, we're certainly still in the mix and we hope to be in the game at this point but if there was a little more confidence in our fanbase about that, then I'd think that would certainly spur ticket sales on." Copeland doesn't believe ticket sales are a sign fans are reluctant to endure the elements to watch the Grey Cup game. "I truly believe there's a certain dynamic and excitement that's added by virtue of being outside," he said. "Toronto in November is manageable. "The games you remember are the ones that were outside, those are the ones that sort of live on."